NARATHIWAT – Two people were killed and four others critically wounded, among them a Senator, in more violence across the restive southernmost provinces yesterday, police said. Fakruddin Bothor, 52, an outgoing Narathiwat senator, was riding his motorcycle from a market in Rangae district early yesterday when he was shot in the face by two men on another motorcycle. Witnesses said the men trailed Fakruddin – who runs an Islamic school – and shot him once with an 11-millimeter handgun. He was being treated in the hospital last night. The gunmen approached him and prepared to shoot him as he laid injured on the ground, witnesses said, but they fled because of the crowds nearby. Police speculated that the attack may have been an act of revenge following Fakruddin’s decision last week to expel more than 100 students from his school. Pol Col Manot Annanrittikul, chief superintendant of Rangae police, said many people were angry with Fakruddin after he ordered the expulsion of students who had become pregnant or addicted to drugs. Caretaker Prime Minister Thaksin Shinawatra admitted tackling the insurgency in the deep South was an uphill struggle and voiced concerns about the attempted assassination of the outgoing senator. 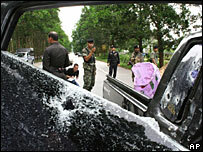 Pracha Taeret, Narathiwat governor, said the attack may have been random, and everyone in the region was at risk. “This can happen to anyone at the wrong place at the wrong time,” he said. In Rueso district, three people were wounded in drive-by shootings, while a bomb exploded near a train station. The son of the Rueso mayor was critically wounded after he was shot by gunmen on a motorcycle, police said. Chanan Chanbiya, 20, was shot twice in the back while sat outside his home. Just a kilometer further down the road, two coal workers were wounded in another drive-by shooting as they walked home. Around the same time, a small bomb exploded near a railway depot, but there were no injuries. Buddhist civilian Suthin Bunkling, 52, was shot and killed as he rode his motorcycle in Pattani’s Nong Chik district yesterday morning, police said. In Yala, a rubber tapper was ambushed and killed on his way to a plantation in Krong Pinang. Police said suspected insurgents hid at 28-year-old Booriya Dulamaehayee’s rubber plantation and riddled his body with bullets from M-16 and AK-47 assault rifles as he arrived. A man who said he was a senior member of insurgent group the Pattani United Liberation Organisation (Pulo) has told the BBC about its objectives. The secretive group's name derives from the ancient Kingdom of Pattani, a semi-autonomous Malay region which was annexed by Thailand in 1902. We want to take our own land back. I won't say we want to separate from Thailand as that would imply we were part of Thailand in the first place. People who live in Pattani have to take their land back - it's their duty. The government should accept the history of Pattani - that is was independent before and that local people are still fighting for their land. This is not about religion, it's about land. But obviously the new state would be Islamic. Have you ever personally been involved in any attacks in southern Thailand? Do you condone these attacks? I don't agree with some things - killing innocent citizens is not right. But it's necessary to attack the authorities because it makes the government here realise that we want independence. If we keep quiet, the government won't take notice of what we want. I'm very sorry for the families affected. Even I am sometimes affected - a policeman who was killed fairly recently was a friend of mine. But we can't avoid these things happening - they will happen until this is sorted out. I find out information about who has died and who killed them, then I send that information to Pulo organisations abroad, in Malaysia, the Middle East and Europe. I also find out whether people who have been arrested by the authorities are members of Pulo. If they are, we work out how we can help them. How did you become involved with Pulo? I went to Iraq in the 1970s to do a course in Islamic studies. While I was there, I saw that my own community did not have the same quality of life as other Muslim communities in the Middle East - our own land, our own country. When I came back here, I started to see the problem more and more. I met other people with similar views and was encouraged to join Pulo. I have been a member ever since. They should negotiate with us directly, with honesty. We would also have to have proper discussions with members of the population here. The government is always demanding an end to the violence, but if we stop now, what will the government give us? We need them to release prisoners, stop the emergency decree and send the army away from this area. We could have middle men to negotiate, like the international monitors in Aceh. How do you relate to other insurgent organisations in the south? The other organisations have the same aims as us, but maybe different systems to get there. I don't want to talk much about these organisations, and I don't know how much they are all linked, but I know there is a network to co-ordinate things. Right now there is a group which has a lot of young blood. They're quick and fast and they don't worry what will happen after they do something. They don't care because they want the government to have a big reaction, which will cause more problems. Where do you get your support from? Our funding comes from local people, or locals who have now moved abroad. When Pulo first started, we had to buy our own weapons from Burma, Cambodia and Vietnam. Now we often get them from Thai officials and also from taking weapons belonging to the military. The raid on the army depot in January 2004 was actually a private agreement. It was made to look like a robbery, but it wasn't actually a robbery at all. Are you linked to any international groups? No. Jemaah Islamiah, al Qaeda, Hezbollah - no, we are not linked with them at all, 100%. In the future, might you target other areas of Thailand? Maybe we will target other areas, like Bangkok or Phuket - I can't guarantee it won't happen. Everything depends on the government. ROI ET, Aug 9 (TNA) - Thailand's Caretaker Prime Minister Thaksin Shinawatra Wednesday expressed confidence that violence in the country's far South will not worsen during the period before the upcoming general election set for October 15. Meanwhile, the prime minister, now on the third day of his trip to the Northeast, did not hastily conclude that the recent attacks on local politicians in the violence-plagued region was purely the work of insurgents, saying the motives were varied. sister of former Thai Rak Thai MP Areepen Utarasin, was slightly wounded by what was believed to be a stray bullet in front of her house in the same province. The incidents prompted local politicians to seek protection as they fear that the insurgents will target politically prominent figures in the restive region. expected to be targeted by the insurgents. Asked if he thought the incidents were politically motivated, the premier said that the current situation stemmed from mixed causes--national and local political conflicts, 'influential figures,' and the drug trade--which were hard to separate from one another. "So it can't be concluded that it was caused by the insurgents. It might be the work of some political group," Mr. Thaksin said. However, the prime minister said he was confident that the violence in the troubled region would not escalate during the period of election campaigns. targets outside the deep South, Mr. Thaksin said briefly that it was kind of propaganda. Acting Prime Minister Thaksin Shinawatra Wednesday lashed out at the Patani United Liberation Organisation (Pulo), accusing the separatist group of a public relations stunt. "They are nothing more than just propagandists," said Thaksin, commenting on a BBC report quoting an unnamed senior Pulo member saying that Bangkok and Phuket could be targets of insurgent attacks. "Maybe we will target other areas, like Bangkok or Phuket - I can't guarantee it won't happen. Everything depends on the government," BBC quoted the source.